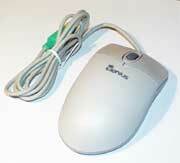 Mouse - a pointing device designed to make the handling with the Windows graphic environment easier. As you move with the mouse, the cursor follows. This ensures easy controlling by help of the cursor and the mouse buttons. More information about various types of mice, connections, alternatives and other information you will find in the "Mice" article. serves for marking (gripping) items or text. It also has a feature similar to the "Enter" button - you can confirm some actions by clicking this button. A single fast push and following release of the button is called a click. This click we use to mark or grip an object. A click can activate an inactive window or move the cursor to a desired point of a document. If you are asked to confirm or submit something by help of clicking a mouse button, it will be the left one in 90% of cases. If the object or a part of it changes its color, it means it has been activated. Fast push and release two times in a short time interval is called double-click. It serves to start programs or open folders. The object stays at its place until the button is released. The move is indicated by the moving transparent copy. Drag and drop function - moves an object or changes the window or the object size. If you want to move an object, you have to point the cursor to it (if you want to move a window, point to the header) and push and hold the button. Then move with the mouse in the direction where the object should be placed and after you reach the desired point release the button. You can also use the "drag and drop" function to move or to copy files and folders in a window or between several windows. Marking several objects - place the cursor at the beginning of the area you want to mark - press and hold the left mouse button - by moving the cursor upon holding the button till the end of the area you will mark all objects in the area - after it is finished, just release the button. Adding further objects - you can make in the same way, but this time you have to hold the Ctrl key pushed or the previously marked areas will be canceled. After you cut an object from the selection you have to keep holding the Ctrl key and by clicking or marking the object to be cut, the object will be taken out from the selection. Clicking the right mouse button you will display the local menu. The menu can differ according to the space where you clicked, the application or the object it is referring to. The menu usually contains a list of options that you can use at the moment. If the object is marked, the menu can contain options such as Copy, Cut, Rename, Remove or others. You can also find here the object's properties. and 2. of the Internet Explorer application. Properties (System control panel), Administrate (Computer administration from the administrative tools), Search (Access to the search windows to search anything on your computer). Properties (Network connections control panel), Search computers, Connect network unit, Disconnect network unit. Empty the bin, Properties (Space size setup for temporary storage of removed files). In the dialog windows it displays the context help. In other applications it performs different functions - here it is also called as function button. The cursor changes sometimes. According to what type of cursor appears, you can immediately see what commands you can carry out at that time or what activity the system does at the moment. The second one of the most important types of cursors is a hand (the first one is a narrow which is needless to explain). The hand appears usually in electronic documents where it shows a link to further sources (Internet sites, another document or its part). If the cursor is pointed to a picture or some text representing the link, the cursor changes and prompts to click. The result of this click is opening of new document or jump to another part of the document. I - a text cursor. It serves for marking text or defining an area for some text to be pasted. In order to insert text this way, just click the space (the field) where you want to insert the text. In order to mark the text, press and hold the button. Working on desktop and busy - these icons signalize that some command is being executed or the system is busy. The best is to wait until these actions are done. Shift - shows that the object or panel can be moved to another place (example in the Start menu article). Fast double click with the left button - starting programs, opening windows (gripping and executing an implicit action). Implicit action is dependent on the object, it can be start of a program, opening of a folder or execution of several tasks at once. To grip an object - to grip an object using pressed left button. The functions for working with the mouse differs according to particular applications. The settings for mouse you will find in Control panels - Mouse. Cursors - a panel for setting up animated cursors representing mouse in different actions you or the operating system can do. You can choose a scheme from various predefined collections of cursors. There also exist files *.ani and *.cur containing cursor. You can also download cursors from Internet or to buy them on a CD, or they can also be contained in themes.